Purpose: Our previous study demonstrated the drug reservoir function of human amniotic membrane (HAM) using stable moxifloxacin as a model drug. The purpose of the present study is to evaluate whether HAM can be used as a drug carrier for extended release of extemporaneous preparation of cefazolin. Methods: HAM Buttons (1 Control, 5 Test) were incubated in a freshly prepared (1 ml) sterile topical solution of cefazolin 5% (w/v) for 3 h and 24 h at two different temperatures. The groups were designated as follows: Group IA: Soaking duration 3 h at 4°C; Group IB: Soaking duration 3 h at room temperature; Group IIA: Soaking duration 24 h at 4°C; and Group IIB: Soaking duration 24 h at room temperature. 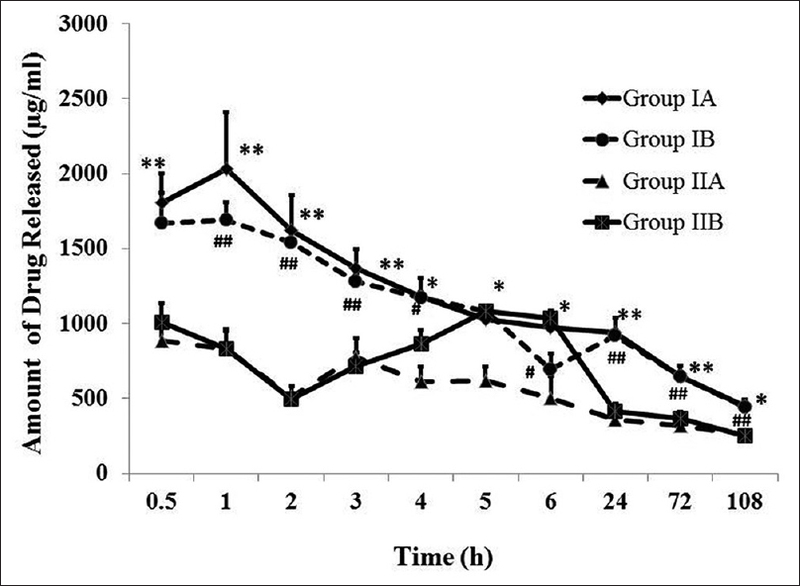 The release kinetics of cefazolin from different groups of drug-laden HAM was studied for a period of 5 days. Samples were assayed for estimation of cefazolin content at different time intervals by High Performance Liquid Chromatography (HPLC) with Photodiode array (PDA) detector. Results: Three-hour cefazolin treatment with HAM at 4°C caused high drug entrapment (24%) compared to room temperature (11%; P < 0.005); however, the release kinetics was not significantly different between Group IA and IB as well as Group IIA and IIB up to the study period. Increase in drug treatment duration did not show increase in entrapment, but caused two-fold (IA Vs IIA) and 1.6-fold (IB Vs IIB) less drug entrapment at 4°C and room temperature, respectively. Conclusion: The results reveal that HAM may be a suitable drug carrier for extended delivery of fortified formulations without compromising stability. Corneal ulceration is a common problem in South India and most often occurs after a superficial corneal injury with an organic material. In a study conducted in Madurai, Tamilnadu, it was found that Streptococcus pneumoniae, a gram-positive organism, was responsible for a majority of bacterial ulcer cases. Similar result of preponderance of bacterial ulcers caused by S. pneumoniae was found in Nepal. However, another study of suppurative keratitis in Gangetic West Bengal, Eastern India revealed that Staphylococcus aureus, another gram-positive organism, accounted for a vast majority of bacterial keratitis. All these studies point toward gram-positive organisms being the root cause of majority of bacterial keratitis cases. The empirical antibiotics available for the management of bacterial keratitis include fluoroquinolone monotherapy or a combination therapy of fortified antibiotics (cefazolin 5% and tobramycin or gentamicin 1.4%). The initial treatment of suspected cases of infective keratitis with fortified topical antibiotics has been the gold standard. Topical fortified cefazolin (5%) has been widely used in the management of bacterial keratitis mainly due to gram-positive organisms including Cornybacterium. Cefazolin is a first-generation cefalosporine antibiotic that acts by inhibiting cell wall synthesis in susceptible bacteria. However, in many countries, cefazolin ophthalmic solutions are not available commercially, and hence, can be prepared when required by mixing parenteral or lyophilized cefazolin sodium with sterile water for injection or with artificial tears. Human amniotic membrane (HAM), with its inherent anti-inflammatory, antifibrotic, and antiangiogenic properties makes up for an excellent substrate for growth, migration, and adhesion of epithelial corneal and conjunctival cells, thereby increasing its use in a variety of ocular surface reconstruction surgeries.,, It is reported earlier that AM transplantation is a useful adjunctive treatment to cefazolin for S. aureus keratitis in rat model. In our previous study, the drug reservoir function of HAM was demonstrated with moxifloxacin (antibacterial for gram-negative organisms) as a model drug, and found that HAM could release moxifloxacin for an extended period of 7 weeks. Therefore, in the present study, the extemporaneous ophthalmic preparation of cefazolin was chosen to investigate the drug carrying capacity of HAM and its beneficial role in the treatment of corneal ulcers mainly due to gram-positive organisms. The present study showed that HAM may be an excellent carrier for not only stable drug formulations but also fortified ophthalmic formulations, and could release drug over a period of 5 days without compromising stability. Therefore, drug-laden HAM may be beneficial for extended release of drugs to achieve good therapeutic concentrations for conditions where a steady supply of drug is needed. The study was approved by the Institutional Review Board of the Aravind Medical Research Foundation, Madurai (IR #: RES2015011BAS). Cell culture plates and dishes were obtained from Corning (Corning, NY). Gratis sample of pure cefazolin standard (96% purity) was obtained from Aurolab, Madurai. HPLC grade solvents were purchased from Merck Chemicals (Mumbai, India). All other chemicals and reagents were of analytical grade and purchased from the chemical vendors. HAM was obtained by elective caesarean section at the Department of Gynaecology, PAMC Hospital, Madurai after obtaining informed consent. The tissues were processed for HAM organ culture by the method described previously, and were handled according to the tenets of the Declaration of Helsinki. The pre-weighed HAM buttons with a mean weight of 40.9 ± 3.9 mg were used for the present study. HAM Buttons (1 Control, 5 Test) were incubated in a freshly prepared (1 ml) sterile fortified cefazolin 5% (w/v) (Aurolab, India) for 3 h (Group I) and 24 h (Group IIA) at two different temperatures [4°C and at room temperature (RT) (25 ± 2°C). The groups were designated as follows: Group IA: Soaking duration 3 h at 4°C; Group IB: Soaking duration 3 h at RT; Group IIA: Soaking duration 24 h at 4°C; and Group IIB: Soaking duration 24 h at RT. At the end of each incubation time, HAM buttons were given a quick wash with simulated tear fluid (STF) to remove the surface-bound drug. Then the drug-laden HAM buttons were placed into six-well plate containing 1 ml STF (without drug) and incubated at 37°C with relative humidity of 65% and 5% CO2. One hundred microliter of the STF was sampled out at different time intervals and replaced with equal volume of STF to maintain the sink condition. The amount of drug released from the drug-laden HAM was studied for a period of 5 days. The amount of cefazolin in all the samples was quantified using high-performance liquid chromatography (HPLC) after precipitating the proteins with methanol (SRL, Chennai, India). The estimation of cefazolin was done using a Shimadzu Prominence HPLC system with PDA detector (Shimadzu Corporation, Kyoto, Japan). The analytical separation was achieved with the mobile phase consisting of triethylamine buffer (pH 8) and acetonitrile in the ratio of 80:20 (v/v) pumped at a flow rate of 0.6 ml/min into Luna C-18 Column (250 × 4.6 mm; 5 μm; Phenomenex, California, USA) maintained at 30°C. 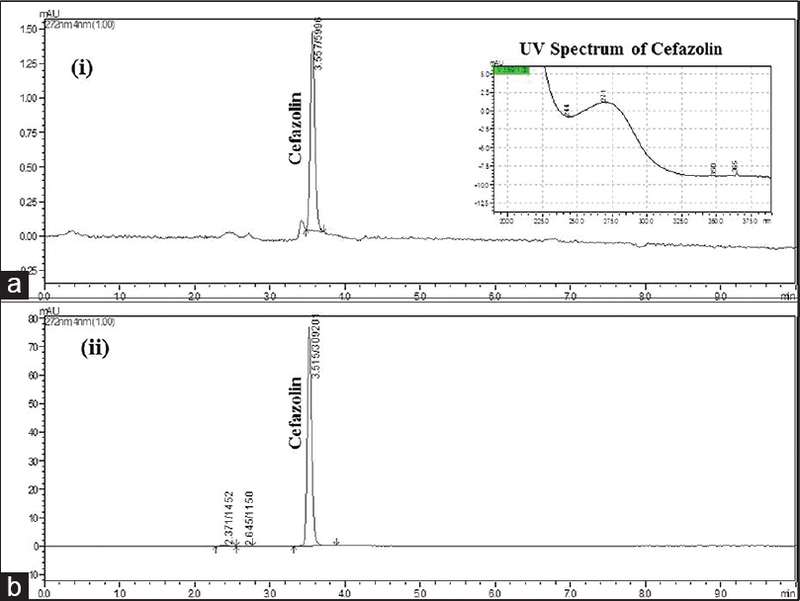 The quantification of cefazolin was carried out at lMax of 272 nm, and the spectral matching was done with an in-built library matching facility in the PDA detector. The values are presented as Mean ± SEM. Mann–Whitney U-test was used to compare the statistical significance between the treatment groups. P < 0.05 was considered statistically significant. In the present study, the HAM buttons were soaked with 5% fortified formulation of cefazolin sodium for a period of 3 and 24 h at 4°C and RT. Because the stability of cefazolin is greatly dependent on pH and temperature, two different temperatures (4°C and RT) were selected for loading drug with HAM. However, the release kinetics was carried out in simulated tear buffer (pH.7.4) at 37°C. The influence of temperature on drug loading and the amount of drug released at different time intervals was investigated over a period of 108 h. The amount of cefazolin in all samples was estimated using HPLC. Cefazolin was eluted at 3.5 min and was found to be stable up to the study period [Figure 1]. The release kinetics of cefazolin in different groups is given in [Figure 2]. The cumulative amount of drug released in all groups is shown in [Table 1]. Three-hour cefazolin treatment with HAM at 4°C caused high drug entrapment compared to RT (Group IA: 12042.51 μg/ml; Group IB: 11126.57 μg/ml). Increase in drug treatment duration (24 h treatment) caused two-fold (IA Vs IIA) and 1.6-fold (IB Vs IIB) less drug entrapment at 4°C and RT, respectively. In all groups (IA and IIA; IB and IIB), the amount of drug released at each time point was found to be statistically significant [[Figure 2]; P < 0.05]. AM was first used as a biomaterial in ophthalmic surgery in 1938. It was applied as a replacement for the conjunctiva following the removal of symblepharon. HAM transplantation has been frequently used since then for the treatment of various ocular surface diseases. Its ability to act as a substrate for re-epithelialization with antifibrotic and anti-inflammatory property makes it an appropriate medium for the treatment of corneal ulcers., However, such cases demand the use of topical anti-inflammatory drugs or antibiotics after AM transplantation for better prognosis. Because topical eye drops have to be applied frequently to maintain good ocular bioavailability, repeated application is recommended in most cases which may cause patients' noncompliance. Hence, there is a pressing need to develop a strategy to deliver drugs continuously without compromising their efficacy. Therefore, in the present study, the drug reservoir function of HAM was evaluated using cefazolin as a model drug with the potential to develop drug-laden HAM as a drug delivering tool for better clinical outcome and prognosis. Cefazolin is the first-generation cephalosporin antibiotic, commonly used as fortified topical drops for the treatment of bacterial keratitis. It is mainly active against nonpenicillinase producing gram-positive bacteria. They are bactericidal β-lactam antibiotics that inhibit enzymes in the cell wall of susceptible bacteria, disrupting cell synthesis. Topical ophthalmic formulation is prepared by adding 5 ml of water for injection to cefazolin injection 250 mg. The drops are refrigerated and should be discarded if they discolor to yellow or after a week, whichever is earlier. It has been reported earlier that cefazolin fortified formulation is stable up to 7 days at 24°C and could be stored at 4°C for an extended duration. Therefore, we have chosen to investigate the effect of temperature (4°C and 25°C) on drug entrapment efficiency with fortified topical cefazolin followed by its transamniotic release kinetics at 37°C. In the present study, we used two different drug soaking times to check whether the increase in drug soaking time could increase the drug imbibing capacity of HAM. The results indicate that 3 h soaking duration at 4°C showed maximum drug entrapment compared to RT [[Figure 2]; [Table 1]. This could be due to the fact that the degradation of cefazolin is curtailed when it was stored at low temperature (4°C) compared to RT (25°C). However, there was no significant difference in the release kinetics of cefazolin between drugs loading (both 3 and 24 h) at two different temperatures. It is found that increase in drug soaking duration reduced the drug entrapment efficiency in HAM. This is in agreement with the observation reported by Resch et al. (2010) where they found that there was a significant difference in the release kinetics of ofloxacin after incubating HAM for 1 h and 3 h only and not between 2 h and 3 h. The authors concluded that 2 h pretreatment might be sufficient to completely fill up the membrane with drug formulations. In our previous study using moxifloxacin, increase in drug soaking time beyond 3 h showed marginal increase in drug entrapment efficiency, however, the release kinetics was not significantly different. This shows that HAM may not need longer exposure time to completely fill up the membrane. Moreover, the mean concentration of cefazolin at 108 h was found to be 446.93 ± 48.24, 442.21 ± 14.22, 254.08 ± 25.02, and 249.39 ± 26.92 μg/ml in group IA, IB, IIA, and IIB, respectively. This shows that drug-soaked HAM can release cefazolin even after 5 days without compromising its stability. Several biological membranes have been utilized for drug permeation studies. Though HAM has been in use in ophthalmology for decades, very few studies have evaluated its drug reservoir function.,, The mechanism by which the drugs bind to HAM is not yet studied. It is of paramount importance to understand how the drug interacts with HAM and the drug uptake by the membrane is simply an absorption process or any complexity involved in releasing the drug molecule over the extended duration. It is still unclear whether the binding of drug to HAM membrane is based on charge or due to altered fluidity and permeability of the membrane. More studies in this line are warranted which would give an insight into the interaction between drug molecules and HAM, as well as the factors that influence the drug binding capacity and hence the reservoir function of HAM. The drug reservoir function of HAM has been demonstrated with fortified cefazolin ophthalmic formulation as a model drug in the present study. Drug soaking at 4°C showed higher drug entrapment compared to RT; however, the release kinetics was not significantly different between the soaking temperatures used. Increase in drug soaking time did not show increase in drug entrapment, and hence brief soaking time may be needed for better drug loading and prolonged drug release. This study further confirms that fortified formulations can also be delivered effectively through HAM. In addition, the availability of freeze-dried technology for the preservation of HAM enables drug-laden HAM as an excellent reservoir system with extended shelf life for clinical use. The authors acknowledge the MUTT study grant for the financial support, the Rotary Aravind International Eye Bank for the supply of processed HAM for the study and Mr. Vijaykumar for his assistance in statistical analysis. MUTT study grant, AEH, Madurai. Srinivasan M, Gonzales CA, George C, Cevallos V, Mascarenhas JM, Asokan B, et al. Epidemiology and aetiological diagnosis of corneal ulceration in Madurai, south India. Br J Ophthalmol 1997;81:965-71. Upadhyay MP, Karmacharya PC, Koirala S, Tuladhar NR, Bryan LE, Smolin G, et al. Epidemiologic characteristics, predisposing factors, and etiologic diagnosis of corneal ulceration in Nepal. Am J Ophthalmol 1991;111:92-9. Basak SK, Basak S, Mohanta A, Bhowmick A. Epidemiological and microbiological diagnosis of suppurative keratitis in Gangetic West Bengal, eastern India. Indian J Ophthalmol 2005;53:17-22. Gokhale NS. Medical management approach to infectious keratitis. Indian J Ophthalmol 2008;56:215-20. Rautaraya B, Sharma S, Ali MH, Kar S, Das S, Sahu SK. A 3½-year study of bacterial keratitis from Odisha, India. Asia Pac J Ophthalmol (Phila) 2014;3:146-50. Kessel L, Flesner P, Andresen J, Erngaard D, Tendal B, Hjortdal J. Antibiotic prevention of postcataract endophthalmitis: A systematic review and meta-analysis. Acta Ophthalmol 2015;93:303-17. Rojanarata T, Tankul J, Woranaipinich C, Potawanich P, Plianwong S, Sakulma S, et al. Stability of fortified cefazolin ophthalmic solutions prepared in artificial tears containing surfactant-based versus oxidant-based preservatives. J Ocul Pharmacol Ther 2010;26:485-90. Lee SB, Li DQ, Tan DT, Meller DC, Tseng SC. Suppression of TGF-beta signaling in both normal conjunctival fibroblasts and pterygial body fibroblasts by amniotic membrane. Curr Eye Res 2000;20:325-34. Solomon A, Rosenblatt M, Monroy D, Ji Z, Pflugfelder SC, Tseng SC. Suppression of interleukin 1alpha and interleukin 1beta in human limbal epithelial cells cultured on the amniotic membrane stromal matrix. Br J Ophthalmol 2001;85:444-9. Barequet IS, Habot-Wilner Z, Keller N, Smollan G, Ziv H, Belkin M, et al. Effect of amniotic membrane transplantation on the healing of bacterial keratitis. Invest Ophthalmol Vis Sci 2008;49:163-7. Yelchuri ML, Madhavi B, Gohil N, Sajeev HS, Venkatesh Prajna N, Srinivasan S.In vitro evaluation of the drug reservoir function of human amniotic membrane using moxifloxacin as a model drug. Cornea 2017;36:594-9.
deRoth A. Plastic repair of conjunctival defects with fetal membrane. Arch. Ophthalmol 1940; 23:522-5. Arici MK, Sümer Z, Güler C, Elibol O, Saygi G, Cetinkaya S. In vitro potency and stability of fortified ophthalmic antibiotics. Aust N Z J Ophthalmol 1999;27:426-30. Resch MD, Resch BE, Csizmazia E. Permeability of human amniotic membrane to ofloxacin in vitro. Invest Ophthalmol Vis Sci 2010;51:1024-7. Bronaugh RL, Stewart RF, Simon M. Methods for in vitro percutaneous absorption studies. VII: Use of excised human skin. J Pharm Sci 1986;75:1094-7. Kim HS, Sah WJ, Kim YJ, Kim JC, Hahn TW. Amniotic membrane, tear film, corneal, and aqueous levels of ofloxacin in rabbit eyes after amniotic membrane transplantation. Cornea 2001;20:628-34. Mencucci R, Menchini U, Dei R. Antimicrobial activity of antibiotic treated amniotic membrane: An in vitro study. Cornea 2006;25:428-31.